Uglyworld #717 - Introducing The Brekkie Bot (225-365), originally uploaded by www.bazpics.com. Unknown to me, Big Toe had convinced photodavid to not only pick up the awesome Ox and Ice-Bat bearbricks at the recent SDCC event, but also a tin robot that he could use to do his every will. Thankfully Big Toe has not used the robot for much so far, at least until this morning that is, when he convinced Trunko to jump into the control room while down in the lower compartments Babo pretended to have a "cookie" steering wheel in his hands and poor Poe didn't quite seem to know whether to be excited or afraid. Once the team were all inside he revealed what task the robot would be asked to perform for everyone, "Attentions, attentions, uglybot do you copy?". For a second or two there was a stunned silence in the room and then with a hiss and crackle of a loudspeaker came Trunko's voice, "...emmm, copies whats?". 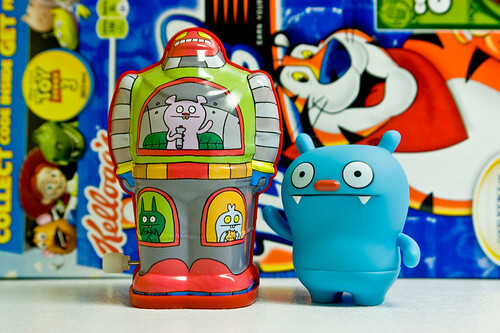 "Doesn't matters, on we goes, Uglybot, you musts make all of us brekkies, you will finds the cereals and milks behinds you". Trunko did his best "beedie beedie beedie, ok Buck" Tweekie impression from the old Buck Rogers TV series and then went about making breakfast for everyone via the joystick controls of the new robot workhorse. Thankfully with Babo and Poe's shouts of "Lefts" and "Rights a bit" Trunko was able to maneouver around and get everything ready without spilling a drop to cheers from the rest of the gang who by then were all sitting at the table waiting on their bowls of Frosted Flakes (an Ugly favourite when it comes to breakfast cereals).